Barricade tape is brightly colored tape (often incorporating a two-tone pattern of alternating yellow-black or red-white stripes or the words "Caution" or "Danger" in prominent lettering) that is used to warn or catch the attention of passersby of an area or situation containing a possible hazard. It acts as a minor impediment to prevent accidental entrance to that area or situation and as a result enhances general safety. Barricade tape is also known as construction tape or barrier tape or in reference to the safety hazard involved as caution tape, warning tape, danger tape or hazard tape. When used by a police force, the tape is named police tape. The tape is often wrapped and affixed as a visual warning sign and demarcation, for instance against entering a dangerous area, such as an industrial or commercial building site, a roadworks construction site or the scene of an accident or a crime (for crime scene preservation), or against handling inoperative machinery or appliances. Barricade tape is made with durable, resilient, tear-proof plastic materials such as polyethylene, polypropylene, or nylon. It is at least 2 mm thick and 3 inches wide. However, different manufacturers offer different sizes and thicknesses of barricade tape. Other common sizes of barricade tape are 2, 4 or 6 inches wide and 4 or 10 mm thick. Barricade tape often has a bright background and pre-printed bold warning text. It is also possible to purchase plain barricade tape and write a custom message on it. However, care should be taken when using custom tape, as all barricade tape designs are required to comply with Occupational Safety and Health Administration (OSHA) and American National Standards Institute (ANSI) regulations (when used for purposes subject to regulation by these organizations). Barricade tape is used according to the color specifications set by OSHA and ANSI. Barricade tape may be use primarily as a safety precaution for various industries and procedures. This is used in construction zones to notify people about ongoing construction and that there are possible hazards within the demarcated area. Construction tape usually employs a yellow-black color combination and incorporates printed text, such as "Under Construction", "Caution", "Work Zone", and "Keep Out" (among others). This type of barrier tape is commonly found at the site of renovations, demolition, and minor repairs. This is used in locations containing a substantial danger. Examples include electrocution hazards or areas within which there is a risk of exposure to toxic chemicals. Hazard tape is available in different color combinations, each of which indicates certain classes of threat. For example, yellow-black tape is used to signal the presence of a physical hazard (e.g., a hole), while magenta-yellow denotes a radiation hazard. This type of barrier tape is commonly used in laboratories, production areas, and industrial zones. This type of barrier tape, as its name implies is used to control traffic, whether foot traffic or vehicle traffic. Traffic control device tapes are used as temporary traffic signal to redirect traffic during parade or whenever a road is closed. These are usually brightly colored, either in solid orange or orange-white combination. This type of barrier tape is used to isolate, protect and preserve a crime scene. Police tape is used to notify the public that an investigation is on going and that a particular area is restricted. This is usually seen with a yellow-white, yellow-black or blue-white color combination. This serves the same purpose as police tape and hazard tape. Firefighter tape is used to isolate a particular area during or after a fire to keep the public away from fire-related risks (e.g., smoke inhalation, airborne particulate matter, and damaged structures). The choice of colours of barricade tape depends on the contrast with its background, which in the case of the sky, can vary from black to white. To have a reasonable chance of being visible against most backgrounds, the tape needs a light colour (white or yellow) and a darker colour. 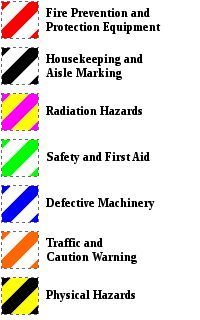 The seven OSHA color combinations for barricade tape. OSHA and ANSI provide precise specification for barricade tape colors. These are found in OSHA regulations 1910.22 and 1910.144 and ANSI Z535.5-2007, Safety Tags and Barricade Tapes (for Temporary Hazards). However, the dimension, thickness, and materials of the barricade tape are left to the discretion of the manufacturer. Red / white for Fire Prevention and Protection Equipment. Wikimedia Commons has media related to Caution tapes. This page was last edited on 7 April 2019, at 14:07 (UTC).